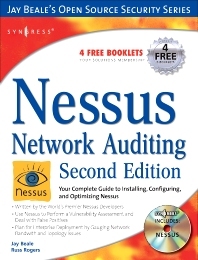 The Updated Version of the Bestselling Nessus Book. This is the ONLY Book to Read if You Run Nessus Across the Enterprise. Ever since its beginnings in early 1998, the Nessus Project has attracted security researchers from all walks of life. It continues this growth today. It has been adopted as a de facto standard by the security industry, vendor, and practitioner alike, many of whom rely on Nessus as the foundation to their security practices. Now, a team of leading developers have created the definitive book for the Nessus community. Use Nessus to find programming errors that allow intruders to gain unauthorized access. Install from source or binary, set up up clients and user accounts, and update your plug-ins. Specify the options for Nmap and other complex, configurable components of Nessus. Plan your scanning strategy and learn what variables can be changed. Prioritize and manage critical vulnerabilities, information leaks, and denial of service errors. Learn the different types of false positives and the differences between intrusive and nonintrusive tests. Understand the architecture and design of Nessus and master the Nessus Attack Scripting Language (NASL). Plan for enterprise deployment by gauging network bandwith and topology issues. Nessus is the premier Open Source vulnerability assessment tool, and has been voted the "most popular" Open Source security tool several times. The first edition is still the only book available on the product. Written by the world's premier Nessus developers and featuring a foreword by the creator of Nessus, Renaud Deraison.